In Phase 1, which opens June 23, 2018, and closes December 21, 2018, Competitors will submit proposals for the competition using an online form. 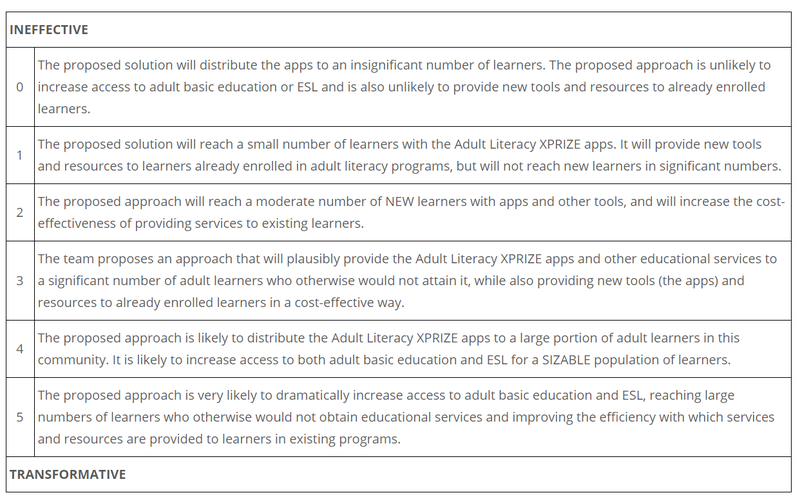 In their proposals, competitors will detail how they will use technology, and especially the apps from the Adult Literacy XPRIZE teams stage, to increase access to adult education for all learners. All proposals will be judged by at least five peer reviewers along five scoring criteria: potential for impact, innovation, feasibility, scalability, and durability. Peer reviewers’ scores will be normalized to ensure fairness. Based on the scores from the peer review, up to 100 teams will move on to a review by an expert panel of judges. The expert judges panel will award an equal share of $500,000 to up to 50 competitors as a milestone prize. While all competitors are required to submit a Phase 1 proposal, performance in this phase of the Communities Competition does not bear on the scoring or results of Phase 2. Description: Is the proposed approach likely to reach a significant number of new and existing learners? Will the proposed approach increase access to both adult basic education and ESL for a sizable portion of the adult learner population in this community? 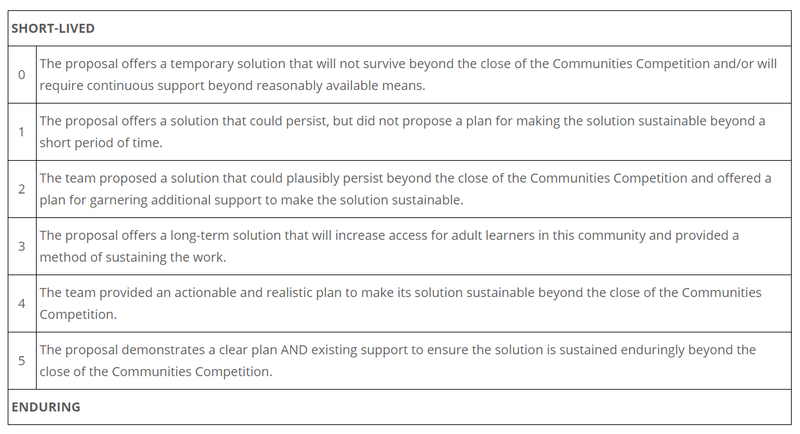 Does the proposed approach present new opportunities to learners who otherwise would not access educational resources? How does the team propose to expand its current footprint and reach both more learners and a more diverse learner population? Description: Is the proposal innovative? Does the proposal offer a compelling vision for the use of technology to increase access to adult basic education and ESL? 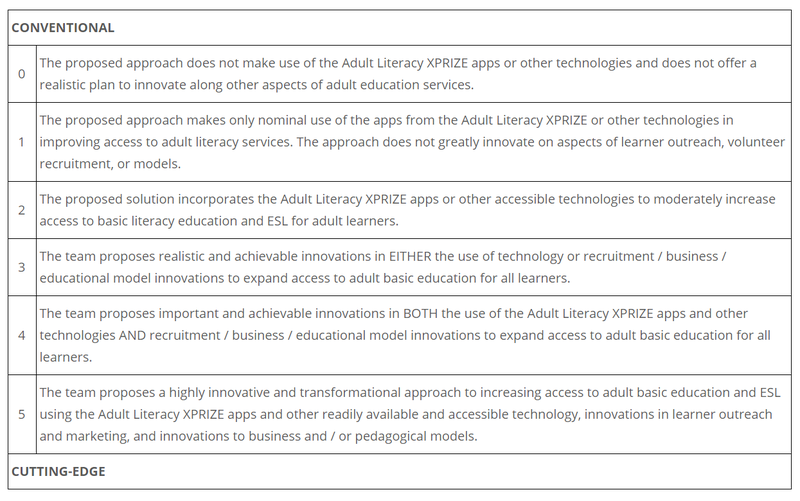 Does the proposed approach make use of technology to improve both the efficiency and effectiveness of adult education services? Does the team innovate in its approach to marketing, learner outreach, volunteer recruitment, and other means of growing its reach? Description: Has the team demonstrated the skills, capabilities, and past achievements to deliver the proposed solution successfully? Has the team set audacious yet achievable goals considering its resources, community size, and experience? 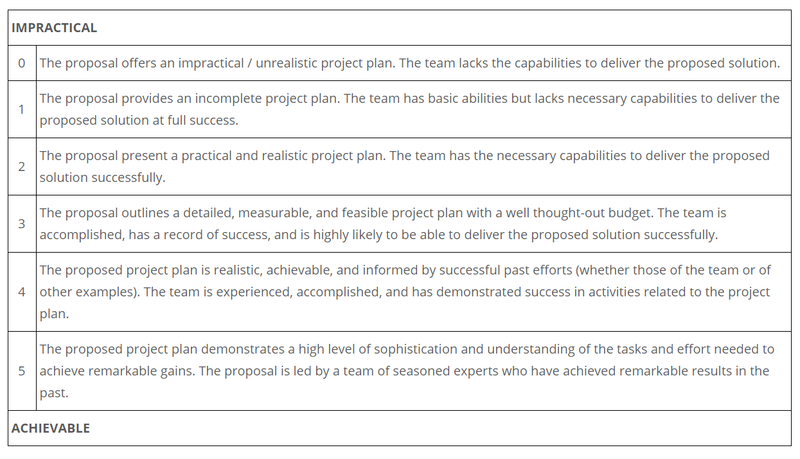 Does the project plan demonstrate a realistic understanding of the tasks and costs to implement the proposed solution? Has the team demonstrated how it will measure its own success? Description: Could this approach be effective at scale? 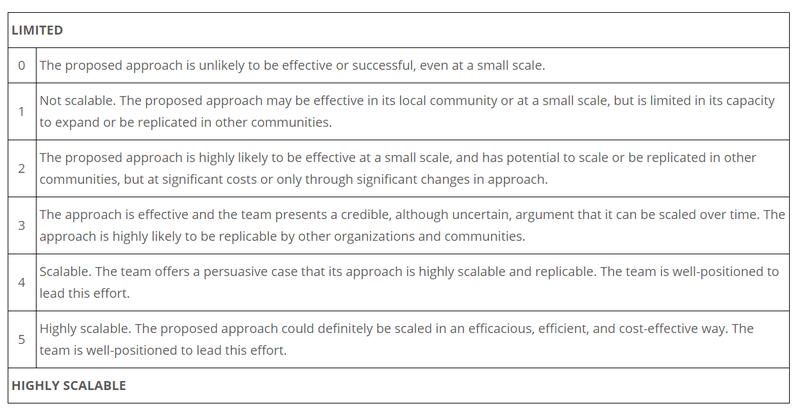 Will the approach scale efficiently and cost-effectively? Is it replicable in other contexts, circumstances, and communities? Could it become a model for other communities and organizations? Is the competing team well positioned to help scale this approach? Description: Does the team propose an enduring solution that will last beyond the timeline of the Communities Competition? Does the proposal offer a plan to continue to support the proposed approach and to incorporate it fully into the competitor’s existing practices and processes?